"Arguments of convenience lack integrity and inevitably trip you up." Donald Rumsfeld is one of those crusty, prickly old guys you admire and enjoy in fiction but find it hard to be around in real life. People who worked with him called him difficult and he made a lot of enemies on the left, in the press (but I repeat myself), and in the pentagon. Rumsfeld had a different idea on how the military ought to be structured, one which would result in a lot of powerful people losing some of that power and jobs being cut from administration. That made him the enemy of the desk jockey brass in the pentagon and his job as President Bush's Secretary of Defense even harder than usual. I really admired Rumsfeld. He was direct, lacked the unctuous charm of most politicians and was not afraid to say exactly what he thought. At first they thought he was fresh, amusing, and interesting, but over time the charm wore off and the hate began to build. Because the press became so hostile, the left did too, following their cue and the tone of reporting. For someone in that position, Rumsfeld handled himself pretty calmly in what must have been an incredibly frustrating situation. I still remember well the press ambushing him on armored Humvees and Rumsfeld's confusion, because he knew that the Humvees being sent into dangerous areas were armored. The press portrayed that as being caught off guard and a show of guilt. See the dirty corporatist is abusing our fine soldiers we love so much! RUSH: Now, do you really think that those pictures from Abu Ghraib, do terrorists really need that to recruit? 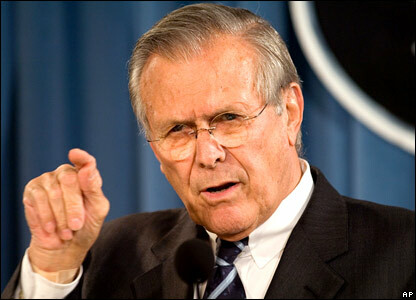 RUMSFELD: No, they're perfectly capable of lying, and they did. I mean take one of the rumors that was spread around the world about alleging that someone at Guantanamo Bay had flushed a Koran down the toilet. There were riots in three or four cities, people were killed, and by the time the truth came around that there never was a Koran flushed down the toilet at Guantanamo, it was absolutely false, and of course the journalist that did it then said if there was some portion of their story that was wrong, they're sorry, but the people were dead already. He's right, terrorist leadership doesn't need stories like Abu Ghraib to generate support for their cause, they lie constantly about abuse of the Koran and magical Jew cats and so on and many in the Muslim world believe them. The Newsweek "flushed Koran" story was such a pile of junk from the start, but they ran with it anyway. The result: dead soldiers and riots that killed civilians. To this day, there are Muslims around the world who believe that story. Newsweek wanted a story to hurt President Bush, and they just bought what they were sold by an accused terrorist because it was politically useful to them. They eventually admitted that it was nonsense, but is an "I'm sorry" enough for such journalistic irresponsibility that it caused people to die? Did anyone at Newsweek offer their resignation? You know, when you think about it, there was a lot of criticism of President Bush and his administration about Guantanamo Bay, about the indefinite detention and military commissions and the structure he put in place to go after terrorists and to put pressure on them everywhere in the world. And after all that criticism and all that fussing, we now have had two years of the new administration and that structure is still in place, and the reason it's still in place is because President Bush did a superb job for this country in defending it. Here we are a decade later and we have not had another attack on the United States of America, and that didn't just happen. Yeah. Pretty much every policy the Bush administration put into place to fight terrorism, Obama has retained, despite being one of the loudest voices of condemnation and criticism of those policies while not being in place to understand them. I am a little bit nervous, but just what I remember about Mr. Rumsfeld is in the immediate aftermath of 9/11, if you remember correctly, Don Rumsfeld refused to leave the Pentagon. He stayed there, making sure all the people got out. The Secret Service, his security detail was trying to get him to leave. He rolled up his sleeves and he was there doing the hard work. While Nancy Pelosi was jetting off every weekend back home to California, while John Kerry was out making excuses why he voted for the war (he was against it before he was for it and this one he was for it, he couldn't ever make up his mind), all the liberals that said all the nasty things they said about Rumsfeld and Bush, Rumsfeld was at the military hospital visiting the troops, visiting their families. Quietly. Never saying anything until eventually he had had enough then he came out and responded to them. Bush and Cheney did the same thing, they repeatedly and quietly visited soldiers and their families, without the press without letting anyone know, because it was about a feeling of deep honor and respect and a debt owed to these people, not about politics or being noticed. Say what you will about those guys, but they really did have a level of integrity and maturity that's lacking in the present (and previous) administration.